In Brose's vision of the AV interior, the front and rear seats are mounted in a rail system hidden in the floor. Using an ap, the driver can program the interior layout so that the four seats face each other and the steering wheel and pedal retract or reposition to be out of the way while the car drives itself. Dozens of electric motors reconfigure the interior, not unlike how a convertible with a folding metal roof operates. For decades, automakers have mounted front seat tracks to the vehicle floor with a bolt at each corner. That's four bolts per seat, and you can usually see them just by looking down. Rear seats are also bolted to the vehicle's body structure. But that simple, safe and secure way to install seats quickly and accurately on the production line is likely to get a lot more complex in the era of self-driving vehicles. Several suppliers are testing prototype interior modules in which the front and rear seats are mobile, flexible and configurable. That scenario brings an array of engineering challenges that will test safety experts in new ways. Airbags, seat belts, how the vehicle's structure manages energy in a crash, and even electrical parts will change as seats become more versatile. "Small changes to the interior can have a dramatic impact on safety," said Steve Peterson, vice president of engineering at German supplier ZF. "When you change the seating, current restraint systems are either going to be completely or somewhat ineffective." French supplier Faurecia believes as many as 15 percent of the vehicles sold by 2030 will have Level 4 autonomy or higher, meaning they will drive without input from a human. If the vehicle drives itself, that frees up the motorist to do other things, and he or she might not be facing forward. But even though safety is expected to increase with self-driving cars, they will share the road with human-driven vehicles, meaning accidents will still happen. "Today safety is the highest priority, and this is going to be the same in the future," said Dirk Brassat, Faurecia's vice president of engineering seating in North America. Faurecia, in its joint venture with ZF, is working to perfect light but strong seat structure technology, while ZF is developing safety technologies dealing with seat belts, pretensioners and airbags. "We cannot reduce any safety requirements, especially when you go into different seating positions," said Brassat. Passengers in self-driving vehicles will probably not want to simply sit upright, facing forward. 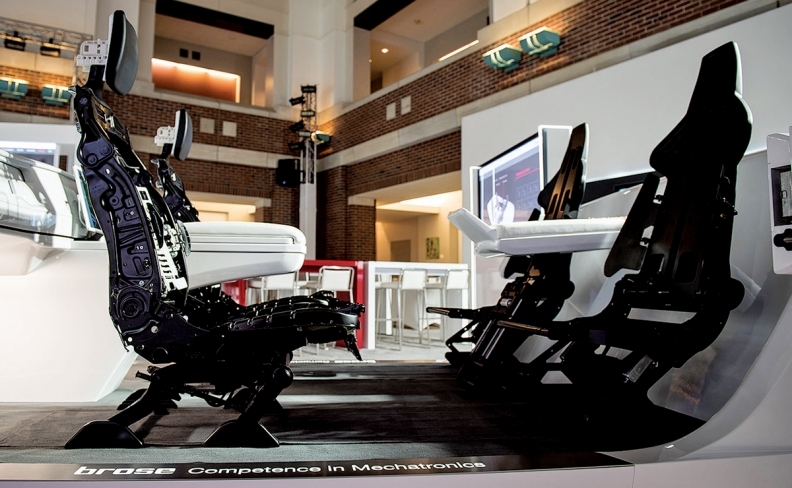 Automakers have shown a variety of seating concepts that swivel, lay flat and move around the cabin. On Lear's ConfigurE system, the reconfigurable seats move on rails; the wiring is routed to the seats from below. Front bucket seats that rotate are not new. Chrysler offered the option on many of its midsize cars in the late '50s and early '60s. General Motors brought back the feature in the mid-'70s. The idea was to improve passengers' entrance and exit by letting them swivel the seats toward the doors. There were no airbags then, just seat belts. But the next generation of mobile seats for self-driving vehicles will be more like those in a luxury jet. 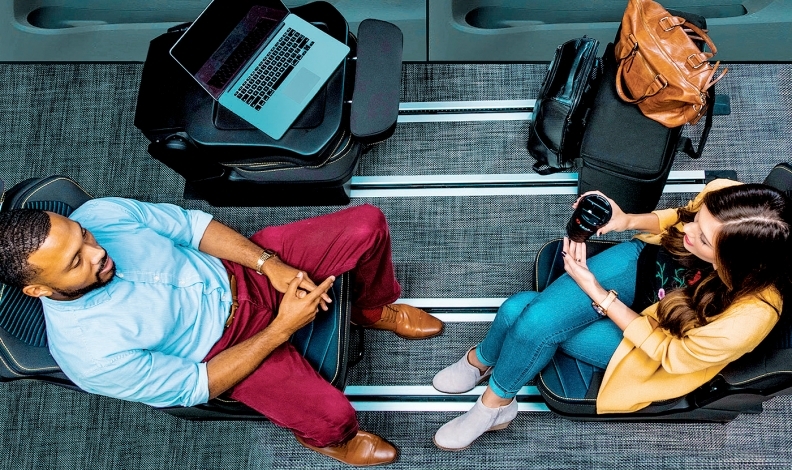 Many suppliers, including Faurecia, ZF, Lear and Germany's Brose, are developing autonomous vehicle seating systems with mountings that travel in tracks or rails in the floor. That means the once-simple chassis rail, a boxed section of steel or aluminum under the floorboard, or the vehicle's floorpan, usually a stamped metal panel with captive nuts for the seat frame, could get far more complex. 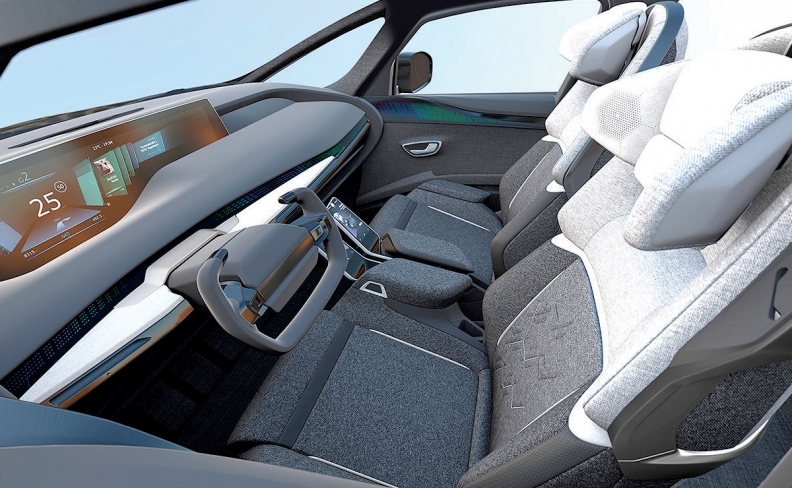 Anil Bhat, director of front seat structures for Brose North America, said the company is working with at least three major automakers to develop seating systems for autonomous vehicles. 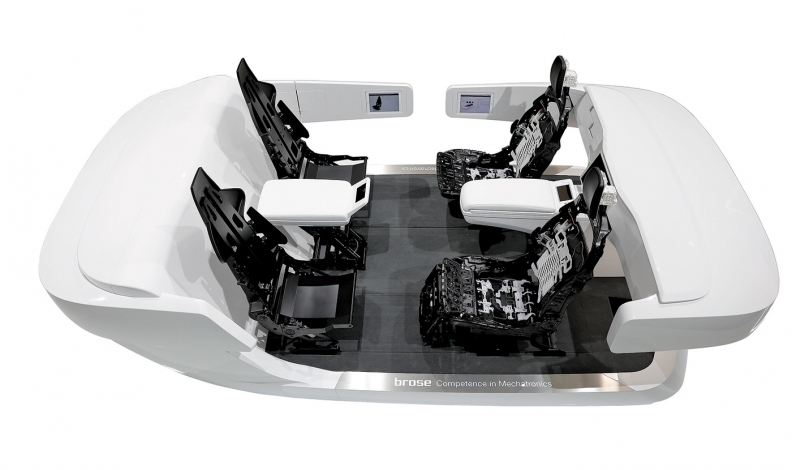 Though Brose doesn't make seats, it produces seating components such as electric motors and structural frame parts. Using seat belts as an example, Bhat says seats designed for self-driving vehicles will change the way safety systems are engineered. Today, when the driver's or passenger's body presses against a seat belt in a crash, that load is transferred to the car's body in the two places where the seat belt is mounted, on the B-pillar and in the floor. If the seat moves throughout the vehicle, the seat belts can no longer be mounted to the B-pillar or attached to the floor, he said. "They have to move with the seat," Bhat said. "So all the belt loads will be going to the car body through the seat. Now the seat has to be so strong that it can take up those loads." And while engineers strengthen seats, they'll have to make sure the seats don't get much heavier, or they could compromise fuel economy. "This is a challenge that we as a supplier are working on closely with the OEMs," Bhat said. "It's in our best interests that we work together from the beginning to the end so that we can ensure that the loads are balanced." Lear, one of the industry's largest seat manufacturers, spent $307 million last year for the seating unit of Spain's Grupo Antolin. One of the key attractions of the deal: Grupo Antolin's electric seat rail system that Lear is working to have ready for production by 2020. "We're designing electric rails within the floor of vehicles. The seats move on a powered rail — so no wiring hanging down," Lear CEO Ray Scott told Automotive News this year. Seat belts will become a self-contained part of the seat structure. That means the seat frames and the rail system will have to absorb the load when a vehicle crashes with an occupant in the seat. Scott said that by connecting the seat's power to the vehicle's safety systems, the seat can automatically move to a safer position when sensors indicate an impending crash. Automakers are thinking along those lines. For example, the seats in the 2019 Audi A8 with the company's pre sense safety system will reconfigure the seats to lessen the impact when a crash is imminent. The upper backrest of the front seats, the rear individual seats and front headrests are moved to help reduce whiplash, Audi says. But Bhat sees future seats going further. Brose, which specializes in small, powerful electric motors, is looking into fast-acting two-speed motors that could move the seats to a safer position in the vehicle when sensors detect an imminent crash. "The motor will have to be more powerful and faster to drive the seats," he said. Faurecia's Brassat said that to enhance safety, the extra-long seat tracks will be integrated into the structure of the floorpan, not simply bolted to it. The key engineering challenge, Brassat said, will be for engineers to ensure rider safety in positions that are not normal in today's vehicles. Current crash tests account for zero-degree turns, when the driver and seat are facing forward. And engineers can predict what happens if a seat turns to face backward, or 180 degrees. "But if you go in positions in-between, say you swivel the seat 45 degrees, that is behavior that is new to us," Brassat said. In self-driving cars, the seats are part of the vehicle's active safety system. When the vehicle detects that a crash is imminent, the seats will configure themselves to reduce occupant injury and could also move on tracks to a safer position in the vehicle. Even though Level 5 self-driving vehicles are decades away, airbags, seat belts and other safety systems have to change as autonomous vehicle technology begins to roll out. "Traditional safety systems are reactionary in nature. Airbags and seat belt pretensioners only respond after an event occurs, limiting the reaction to milliseconds," said David Kazyak, Lear's vice president of global seat engineering. "As vehicles depart from traditional seating positions, even to relaxed riding positions, traditional methods become less effective."